After a speedy transit through the Mozambique border we were faced with a tedious 1.5hrs of Malawian bureacracy at the Mwanza border; it was a busy Friday afternoon with just one official dealing with the new computerised Temporary Import Permits for vehicles - a real drag. However it was a delight to be back in Blantyre at Martin and Miriams' flat. What a positive transformation Blantyre has undergone in the 5 years since we last visited; clean streets, new buildings, good roads, a general sense of order; we would have previously compared Blantyre to many of the West African cities we have visited - dirty, chaotic, etc, but not now, Blantyre has entered another league - well done! We have started to think about flights home and we are considering flying from Malawi to Kenya, with a stop-over for a few days in Nairobi, to visit our VSO colleague and friend Winnie and then on to the UK; we are also going to have to start thinking about acquiring a cheap second-hand vehicle in the UK. But forget all of that for now, let's go to Mozambique for a while to do a little more exploring! After returning from Mozambique through the Mandimba/Chiponde border crossing again, we headed off for Lake Malawi and the campsite at Nkopola Lodge; a very modest site with clean wash facilities and within easy reach of the main lodge and restaurant. Thirsts were quenched with our first 'Chapmans', a delicious drink made from orange juice, ginger beer and Angostura bitters (with probably a few added ingredients that I can't recall). Then it was two days of relaxing, book reading, meeting other campers - a couple from Blantyre (Eugene and Debbie Murphy with their two sons) and a group of 4 South Africans on their way to South Luwangwa, with the full Safrican camping tent trailer et al. On our first evening we were entertained (from a distance) by a group of children and staff from an orphanage/school singing songs whilst sitting round a campfire on the beach. It was their last night of a week camping. They had spent most of the afternoon splashing about in the lake having great fun. It was really good to watch.The following day was a visit to Club Makokola for lunch and a swim both in the lake and their lovely swimming pool; there were some tourists from England. We have been surprised at the number of tourists that we have met who had chosen to holiday in Malawi for their first Africa trip, an encouraging sign for Malawi tourism..
We moved on to camp at Mvuu in Liwonde National Park, just to remind us what elephants look like (as if we are ever likely to forget after our Namibian experiences!!) What a daft thing to do - I spent a sleepless night listening to the elephants crashing through the trees in the camp and hoping we weren't going to get trampled on whilst Nigel snored his way through much of it. We both got up in the night to go to the loo and flashing the torch around came upon a very large hyena, sniffing his way round the campsite a few metres away from us; fortunately he sloped off in the opposite direction but it was a bit scary. That evening we met Clare and John, a couple from London, backpacking around Malawi; they had actually abandoned their tent the previous night because of the elephants. A boat safari on the Shire river is something very special, so next morning we spent 3 hours spotting many birds, crocodiles, hippos and a herd of 60 elephant on the river bank - it was great. 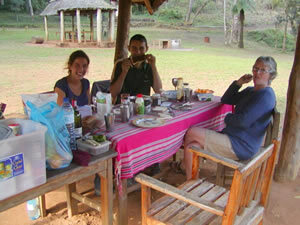 Back to Blantyre - One night of elephants crunching around the tent was enough for us so we gave Clare and John a lift up to Zomba Plateau and enjoyed a picnic lunch at the Kuchawe Trout Farm high up on the mountain amidst the green hills and forests. 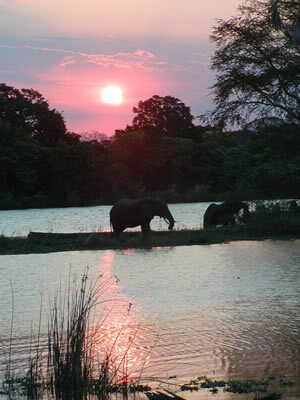 With its cool and fresh climate it's not surprising that it was chosen by the British to be the first capital of Malawi before Lilongwe took its place. We left C & J to camp there whilst we made our way back to Blantyre to await the arrival of Martin & Miriam and to book our homeward flight, we leave Blantyre on Wednesday Sept 23rd to arrive in Manchester on Thursday Sept 24th. We are going to leave Mitzi (our vehicle) with Martin, pending a possible return to Malawi etc in March 2010.